About 11 percent of all free games in Apple’s App Store (s aapl) have in-app purchase for virtual goods, currency and additional features. But these freemium apps have an outsized influence on the App Store, making up 40 percent of all free game downloads from the store in March, according to a new study by mobile app search firm Xyologic. Xyologic, which indexes apps on iOS, Android (s goog) and Windows Phone 7 (s msft), said in March there were 99.9 million downloads of free games in the App Store in the U.S., of which 39.9 percent were free games with in-app purchase. 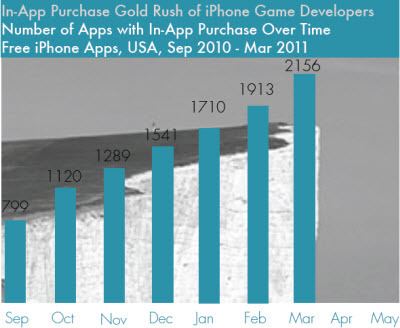 Overall, 8,017 iPhone apps offered in-app purchase, and 2,156 of them were freemium games. But despite only accounting for 10.8 percent of all free games, freemium titles made up 94 of the top 150 free iPhone games in March, or 63 percent. And they make up 42.17 percent of downloads within the top downloaded apps. It’s a testament to the power of the freemium model, which has flourished in the last year, allowing developers to trade on consumer’s desires to download free apps while upselling them later on extras. But with Apple’s recent crack down on incentivized installs, the freemium boom may hit a wall, because many freemium apps used incentivized installed to drive downloads and make money. Xyologic doesn’t actually track the number of apps that use cost-per-install campaigns. Those campaigns allow a consumer to gain virtual goods or currency in one app for downloading another. The developer who gains a new user pays a middleman, who shares the revenue with the original developer who offered the incentivized install in their app. This practice has been used by many app developers, particularly freemium app makers, to get into the top rankings, where they could enjoy more downloads. They basically paid for downloads and made it up on in-app purchases from users. But recently, Apple stepped in and started rejecting apps that use incentivized installs, citing rules that prohibit gaming of the rankings. Now we’ll have to see what effect the enforcement will have on developers. I’ve talked to some developers who said they had to drop the incentivized install offers in their apps, which means less revenue. They hope they can make up for the shortfall with better display ads. Others are having to deal with the prospect of fewer downloads from cost-per-install campaigns. It will force some to focus on advertising through more traditional and more expensive display ads, but it could also prompt others to look to Android (s goog), said Xyologic. While the effects of Apple’s crackdown are still being worked out, it’s clear companies that have relied on cost-per-installs on iOS are having to react. It likely won’t kill the freemium app boom, but it does force changes in the business models of many, and it requires app makers to focus more on quality and engagement than simply on downloads. It will also mean the pace of downloads could actually slow on the App Store. Apple’s goal was likely preserving the quality of its rankings by prohibiting incentivized installs, but the change could cut out a lot of downloads that came through cross-app marketing. Apple was already rejiggering the app store rankings to emphasize engagement, but downloads are still a part of the equation. Now, we could see apps heavily reliant on cost-per-installs fall in those rankings, which will also have a negative effect on revenue. Hard to follow. There’s a lot of mixing and matching between apps and games in the article. What is what? The graph points to apps, the articles refers to app sub category games. Don’t know what to think of it all. Turbcast is a great app for fear of flying.